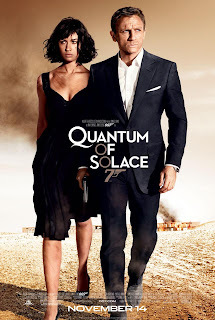 Quantum of Solace (2008) is another one of those films which I took a while to watch. I was really looking forward to it, because Casino Royale was one of the most enjoyable films I watched in 2007. So, Quantum should have been exactly like that. Yes, it had bombs, guns, killing, fast cars and beautiful women, but it did not have the excitement that Casino Royale had. Daniel Craig is the only Bond I've ever bothered watching, because I'm not a huge fan of Pierce Brosnan (I was quite disturbed by his singing in Mamma Mia! ), and he was great in Casino Royale. But what Quantum (the title is a little strange) was lacking fun. All it was was a violent killing spree film, with no smiles or laughs to keep the film level. The film carries on from the previous, Bond is so bitter about Vesper Lynd's death (who was played perfectly in Casino Royale by the beautiful Eva Green), that he decides to make everyone's life miserable. He meets Camille (Olga Kurylenko) who is in to violent action as well and together they try and tear down the people they hate. Agent Fields (Gemma Arterton, who was also in St. Trinians) tries to stop Bond from committing more murders, but she doesn't last long. All that is left is M (Judi Dench), who tries to calm Bond's antics down. But of course, him having a license to kill, he'll use that license to great extent. The villain, who is not as great as Le Chiffre, is Dominic Greene (Mathieu Amalric), is lacklustre and doesn't prove enough trouble. However, though the film suffers from major flaws, it is still a good action film, especially if you like the darker side of Bond.